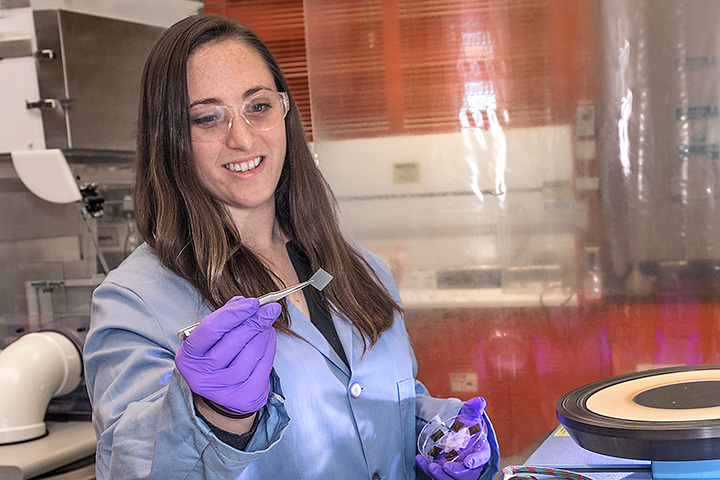 Polymer chemist Samantha Nowak recently joined Brookhaven Lab’s Center for Functional Nanomaterials as a postdoctoral researcher studying polymer self-assembly. Here, she holds silicon wafers containing block copolymer thin films. In front of her is a plasma etch tool, which she uses to remove the domains of one of the “blocks,” or polymers, in the block copolymer. This removal is part of a process that helps Nowak better see the nanoscale self-assembled patterns (using a scanning electron microscope) formed by the block copolymer. When Samantha Nowak was growing up, her grandmother would complain about how she could not get her nail polish off. At the time, pure acetone—the solvent that dissolves nail polish—was not widely available. Nowak’s grandfather, a polymer chemist, would bring the “magic” nail polish remover home from his lab, explaining how solubility works. Nowak also vividly remembers her grandfather dropping metal salts into solution as she watched them rapidly crystallize to form interesting structures. Despite her interest in science, Nowak was set on being a lawyer up until the end of high school, when her honors chemistry teacher told her about The College of New Jersey’s forensic chemistry program that her daughter was enrolled in. Nowak, a big fan of the television series Law & Order: Special Victims Unit, figured a career in forensic chemistry would allow her to combine her dual interests in science and law. But after declaring chemistry in her first semester at the College of New Jersey, Nowak decided that forensic chemistry was not for her. She decided to continue the general chemistry track, receiving her bachelor’s degree in 2014, with an interdisciplinary concentration in law and society. 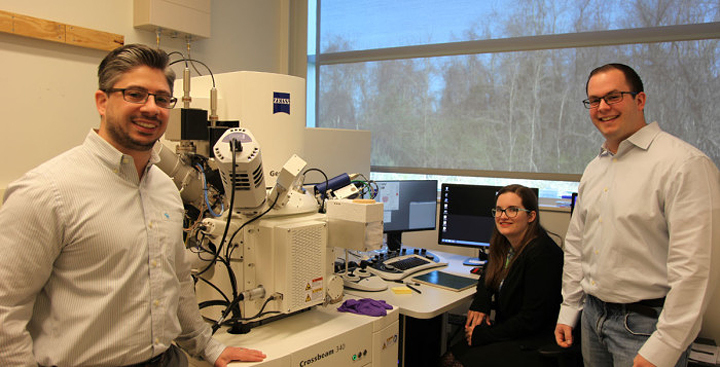 After graduating, Nowak entered a PhD program in chemistry at the University of Maryland (UMD), College Park, where she joined the Sita Research Group and began synthesizing and studying a new class of self-assembling materials called sugar-polyolefin conjugates. Self-assembly refers to the ability of certain molecules to spontaneously organize into ordered structures—such as spheres, cylinders, and lamellae (sheets)—as they try to achieve their lowest-energy state. 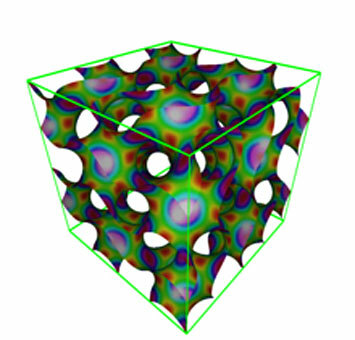 An illustration of the three-dimensional gyroid structure. This geometric configuration is found in butterfly wings and elsewhere in nature. For example, the sugar-polyolefin conjugates can self-assemble into stable “gyroids”—infinitely connecting structures with a minimal surface area containing no straight lines—that are lightweight yet extremely strong. These rare and complex nanostructures would be difficult to obtain and stabilize within traditional block copolymer thin films, especially those as thin as needed for electronic and optical devices. But if scientists can access gyroids and other structures with unique geometries (and thus properties), new applications may be enabled. 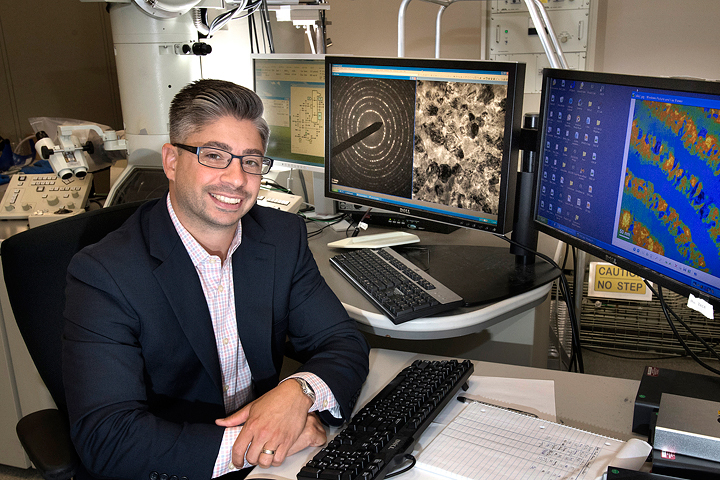 In Nowak’s third year, advisor and principal investigator Lawrence Sita contacted Kevin Yager—group leader of Electronic Nanomaterials at the Center for Functional Nanomaterials (CFN), a U.S. Department of Energy (DOE) Office of Science User Facility at Brookhaven National Laboratory. Sita thought his group’s research on the sugar-polyolefin conjugates could progress even further with Yager’s expertise and the x-ray scattering capabilities available at Brookhaven Lab’s National Synchrotron Light Source II (NSLS-II) [below], another DOE Office of Science User Facility. At the time, Yager was in the process of developing new equipment and techniques and looking for users for the Complex Materials Scattering (CMS) beamline, which the CFN and NSLS-II operate in partnership. “The group’s results were intriguing to me—both because they were able to create very small self-assembled structures, and because their results seemed to violate my expectations for the kinds of structures those materials should form,” said Yager. Sita and Nowak wrote and submitted a proposal for beam time at CMS. 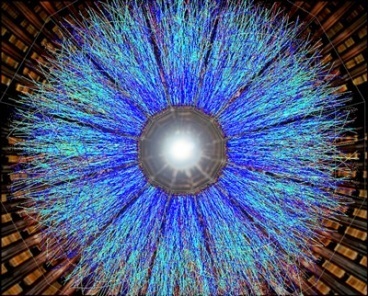 Their proposal was accepted, and the research Nowak conducted at the beamline ended up becoming a large part of her PhD thesis. In particular, she used a scattering technique called grazing-incidence small-angle x-ray scattering (GISAXS). In GISAXS, a high-energy x-ray beam reflects off of a thin film or substrate at a very shallow angle. 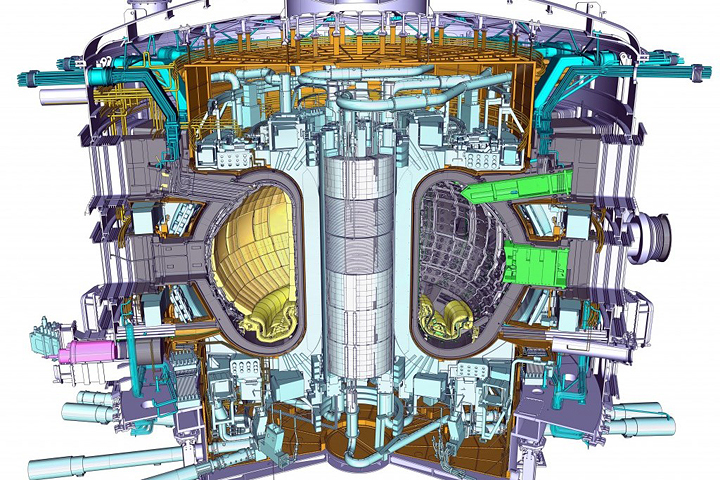 The pattern of the scattered x-rays provides information about the size, structure, and orientation of any self-assembled structures within and on the surface. 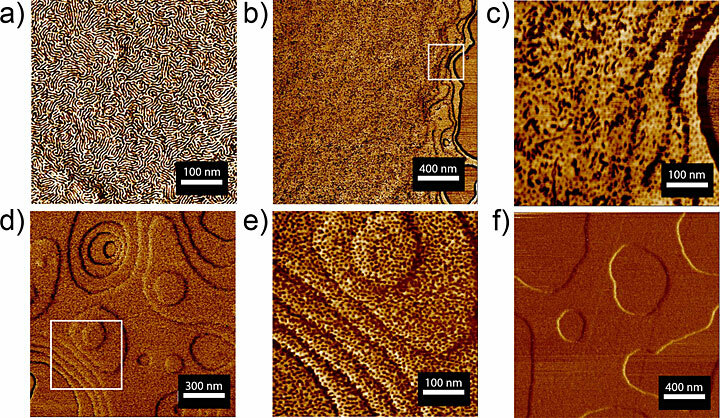 Atomic force microscope images of a sugar-polyolefin conjugate ultrathin film (30 nanometers) at room temperature that the Sita Research Group heated to 140 degrees Fahrenheit for different lengths of time: (a) original ultrathin film, (b) after 14 hours, (c) a zoomed-in region corresponding to the white square in (b), (d) after 24 hours, (e) zoomed-in region corresponding to the white square in (d), and (f) after 48 hours. The images reveal how the morphology evolves in response to heating over time. Source: Journal of the American Chemical Society 2017, 139, 5281–5284. The conjugate materials in this case were made out of cellobiose (a sugar derived from cellulose in plants) and polypropylene with a low molecular weight. From their studies, they learned that increasing the temperature caused several different well-ordered morphologies (structural arrangements) with very tiny feature sizes to emerge in both the bulk material and ultrathin films. By jumping to a specific temperature or slowly increasing the temperature, they could control which morphology they ended up with. And if the polymer chain was too long, the structures that formed were more limited in variety. During one of her visits to the NSLS-II for beam time, Yager mentioned to Nowak that he was looking for a postdoctoral researcher at the CFN. Nowak had all intentions of working for industry immediately following graduation, but the combination of her experience as a user and conversation with Yager changed her mind. Nowak received her PhD in August 2018 and joined the CFN in October. 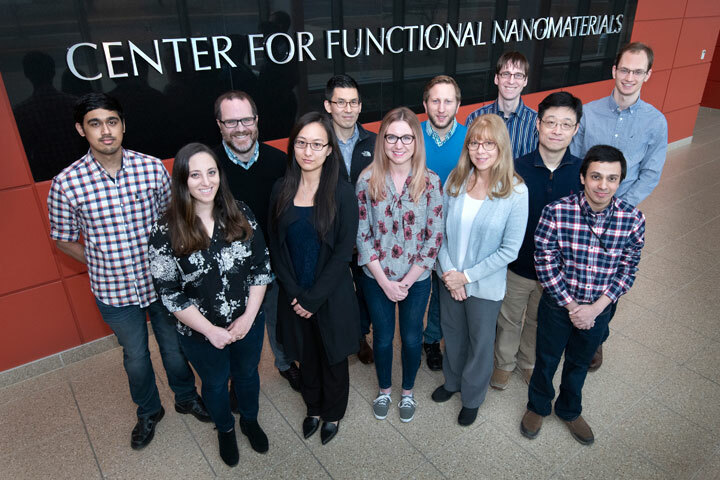 Samantha Nowak (front row, left) recently joined the Center for Functional Nanomaterials as a postdoctoral researcher in the Electronic Nanomaterials Group, led by Kevin Yager (back row, second from right). Under the co-advisement of Yager and CFN Director Charles (Chuck) Black, Nowak is studying self-assembly using thin films of well-established polymers (polystyrene (PS) and poly(methyl methacrylate) (PMMA)) to create novel “non-native” morphologies (i.e., those that deviate from the bulk morphologies). 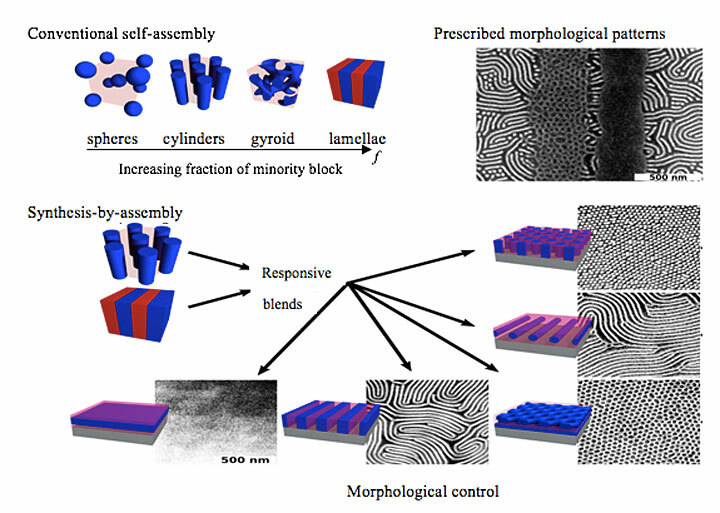 Mainly, she is blending block copolymers with different intrinsic morphologies—the morphology they prefer to adopt based on the volume fraction, molecular weight, and surface energy of the respective blocks. For example, one block copolymer may form cylindrical nanostructures and the other lamellae. But when the block copolymers are blended, they adopt morphologies that are completely different than those of the individual components. After forming block copolymer thin films by spin casting them from solution onto a flat surface, Nowak heats them on a hot plate. Introducing heat provides energy for the block copolymer film to spontaneously order into patterns with nanoscale features. In order to more easily see the structure of the films, Nowak then converts the PMMA domains into an inorganic replica through sequential infiltration synthesis—a chemical method in which a polymer is infused with an inorganic material by exposure to gaseous metal precursors in multiple cycles—and etches away the polymer with oxygen plasma. 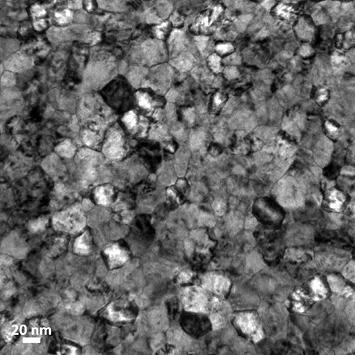 “With this approach, I have better contrast when I look at the films in the scanning electron microscope,” said Nowak. Most recently, Nowak has been seeing what happens when she changes the composition of the block copolymer blend. One unexpected result so far was the formation of hexagonally perforated lamellae from cylinder and lamellae block copolymers. In another experiment, Nowak used the same exact blend of block copolymers but changed the surface energy. The result was either a single nanostructure or a combination of line and dot patterns, hexagonally perforated lamellae, and horizontal lamellae. Nowak is also exploring how to chemically pattern substrates as a way to “program” which morphologies appear in particular regions of the substrate. She is in the process of getting training in the cleanroom of the CFN Nanofabrication Facility to perform this patterning. The combination of different nanostructures within a single substrate in a predetermined fashion could expand the range of applications—something that Nowak had not previously thought much about. Conventionally, block copolymers self-assemble into a limited range of morphologies, such as spheres and lamellae. But by using appropriate block copolymer blends and a chemically patterned substrate that contains the “instructions” for which morphologies appear where, scientists can significantly expand this range. Nowak, Yager, and other CFN scientists recently obtained four different nanostructures—dots, lines, horizontal lamellae, and hexagonally perforated lamellae—in predetermined regions of a single substrate. After her postdoc, Nowak plans to enter industry as a polymer chemist. She has not yet decided which industry, but she is currently considering cosmetics or consumer goods. The added color in this scanning electron microscope (SEM) image showcases the discrete, self-assembled layers within these novel nanostructures. The pale blue bars are each roughly 4,000 times thinner than a single human hair. No image credit. An aerial view of a complete, self-assembled, multilayer nanostructure. In this instance, parallel bars of block copolymers with varying thickness were criss-crossed. No image credit. This image shows the range of multilayer morphologies achieved through this new technique. The first column shows a cross section of the novel 3D nanostructures as captured by scanning electron microscopy (SEM). The computer renderings in the second column highlight the integrity and diversity of each distinct layer, while the overhead SEM view of the third column reveals the complex patterns achieved through the “intelligent” layering. No image credit.